Step 1: Navigate to the "Admin" panel found on the top navigation bar. Step 4: At the end of the "Company values" page, click the "Add another value" button. This will add a new entry in the values section that you can fill in with a title and description. Remember that it's helpful to provide a description of what a value means to your company so that everyone understands how to apply them to Feedback! Once you've finished filling in your new company value, be sure to click the "Save values" button at the bottom of the page to save your new additions or edits. 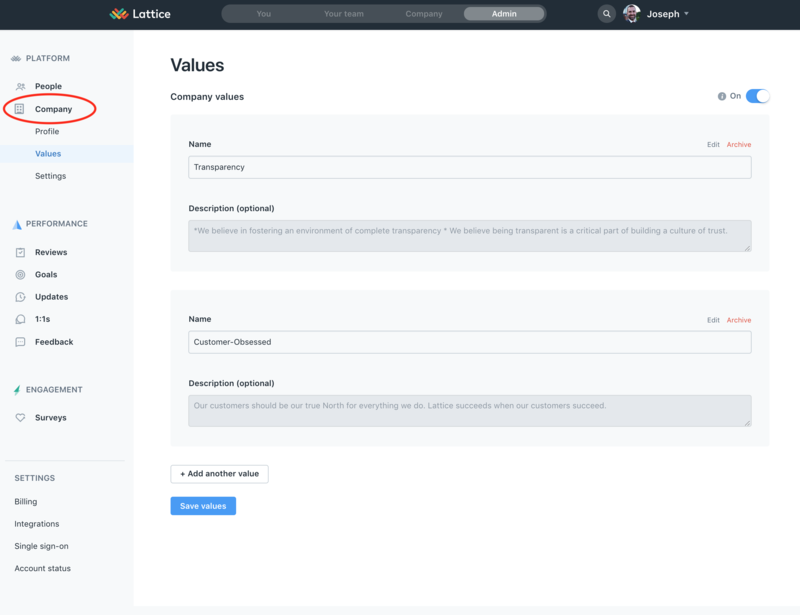 All existing company values are viewable on the "Company values" page. To edit one, simply change the text in either the title or description field and hit the "Save values" button at the bottom of the page to save your work. If you do not want to use values for your organization, simply click the toggle at the top of the the "Company Values" section. If this toggle is enabled, all users can attach a company value to a piece of Feedback. If disabled, users will not be able to specify any company values. To delete an existing company value, simply click the "Archive" link attached to a company value. You will be prompted to make sure that you want to archive this value!